(Photo: REUTERS / Kim Hong-Ji)Relatives of the April 16 ferry disaster victims comfort students who survived the accident as they make their way back to school in Ansan June 25, 2014. 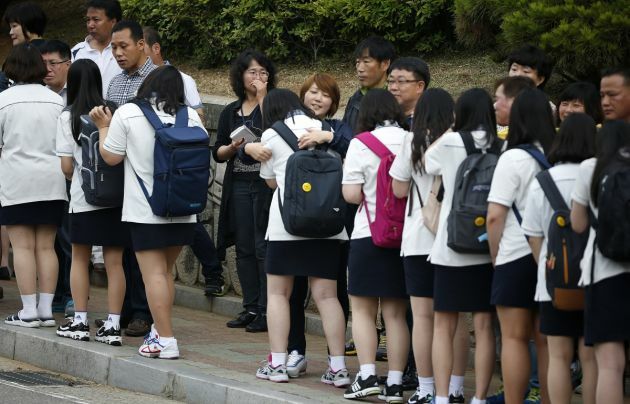 Holding hands as they walked through the school gates, some fighting back tears, 75 children who survived South Korea's worst maritime disaster in 20 years, returned to class on Wednesday vowing to remember their lost friends. Wailing parents of the 250 children who did not survive, when a ferry taking them on a school trip capsized and sank, greeted the children outside the Danwon Highschool. Not even Pope Francis can make the families of the victims of South Korea's ferry disaster in April yield. Relatives of the victims camping in a Seoul ceremonial plaza have threatened to defend their turf if they are driven away from there, ucannews.com has reported. The Pope will officiate at a beatification mass for Paul Yun Ji-chung and 123 of his companions in Gwanghwamun Square, where the victim's families have holed up for the past three weeks. They are demanding a full-blown inquiry into the sinking of the ferry, the Sewol on April 16. The mass will be held in front of the Gwanghwamun Gate and is expected to draw a million Korean Catholics on August 16 since it will be the first visit of a pope to the country in around a quarter of a century. "We will never remove our tents here until our demands are met," Park Yong-Woo, a family member and spokesman for the protesters, told reporters. Park insisted that protesters would hold their ground and defend their place if authorities were to consider forcing them out of the park. But he conceded though that the protesters were speaking with church officials about their presence in the plaza, hinting that there might be negotiations. The government is treading carefully on the issue. Authorities consider Francis' visit to Seoul an important event. The government is also wary of not further agitating the families of the disaster victims, with the public keeping a keen eye on how they would be treated. Relatives and supporters of the Sewol tragedy are pressing the Korean parliament to call for a full, independent investigation into the tragedy that claimed some 300 lives, mostly students. A bill is pending before the National Assembly, with lawmakers locking horns on the extent of the legal powers to grant to an investigating body. Park said the protesters have informed the Pope about their predicament through a letter they sent. They also appealed for understanding.